Retired businessman Derek McLennan was sick and really didn’t feel like dragging his carcass and his metal detector to a Church of Scotland field near Castle Douglas in Dumfries and Galloway, Scotland, last month. 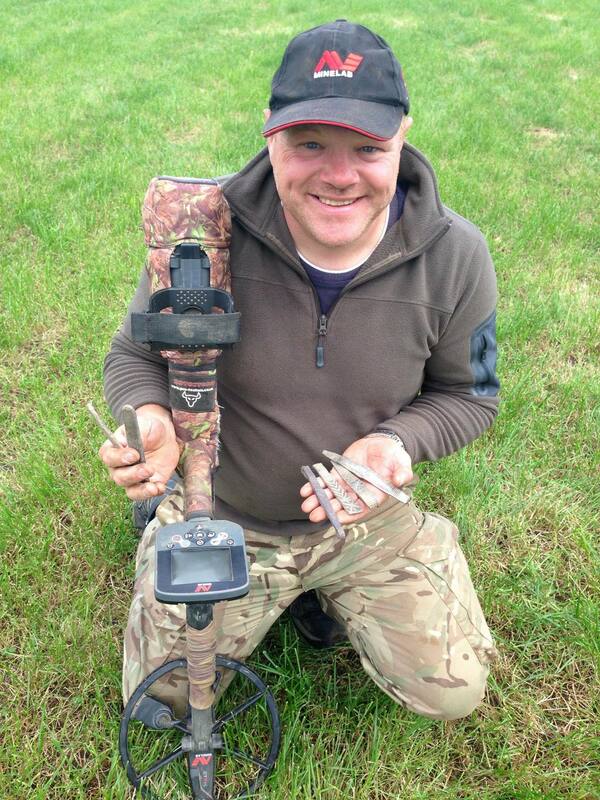 He didn’t want to disappoint his detecting buddies the Reverend David Bartholomew and Mike Smith, pastor of Elim Pentecostal Church, however, so he pulled it together and off they went. After an hour of searching, McLennan found a piece of silver buried two feet under the surface. 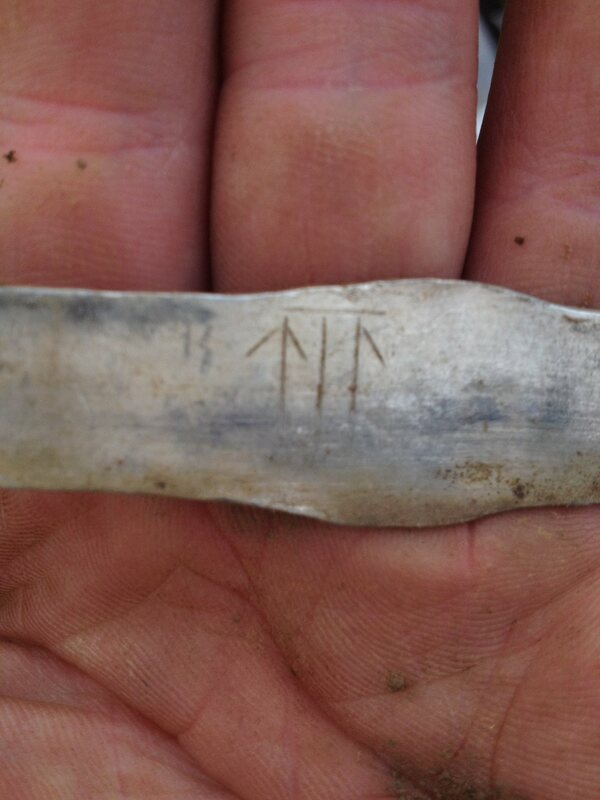 At first he thought it was a spoon, but when he wiped some of the dirt off it, he saw a saltire (X marks the spot) design and realized he’d unearthed Viking treasure. 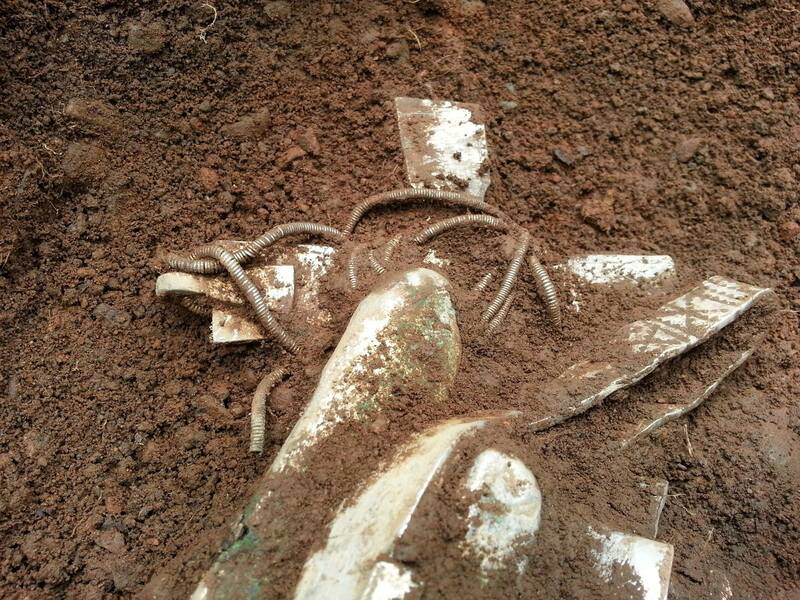 McLennan reported the find to Scotland’s Treasure Trove Unit and soon Galloway Council archaeologist Andrew Nicholson was on the scene excavating dozens of silver ingots, decorated arm rings and a solid silver cross with enamel decoration from the find spot. 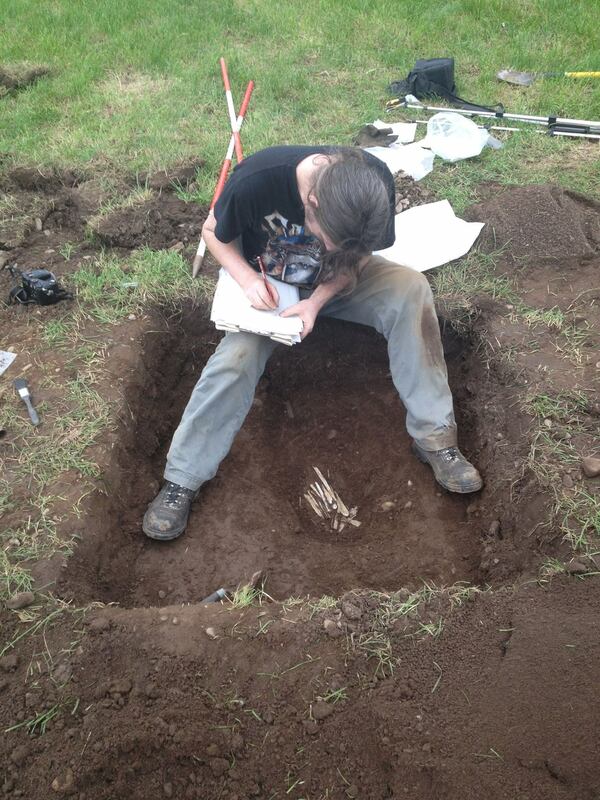 When the artifacts were fully excavated, McLennan ran his machine over the hole again and again got a signal. 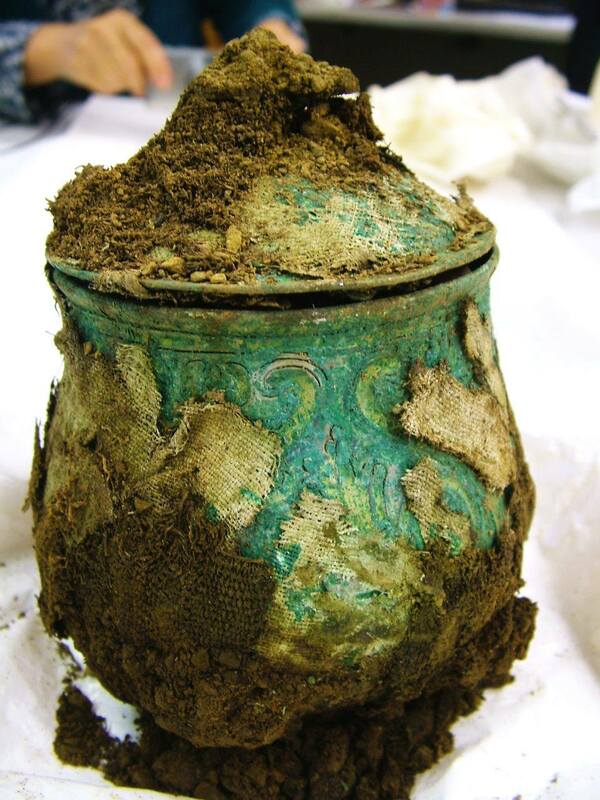 More digging unearthed a second layer of treasure, including a silver Carolingian pot complete with its lid that is one of only three of its kind ever found in Britain. All told, the hoard proved to include more than a 100 individual pieces. It’s the largest Viking treasure found in Scotland since 1891, and there’s the possibility of more to come when the silver pot is opened and its contents excavated in the lab. The array of artifacts — stamp-decorated bracelets from Ireland, glass beads from Scandinavia, a beautifully graceful gold bird-shaped pin or hair ornament, silver ingots marked with runic inscriptions, even textile fragments still attached to the Carolingian pot — make this a find of international importance. The hoard was buried in the 9th or 10th century. The silver cross dates to around that time. Its unusual enamel decoration is figural, possibly depictions of the four evangelists on each arm of the cross. The pot was already at least a hundred years old when it was buried, hence archaeologists’ belief that it may have been a family heirloom. 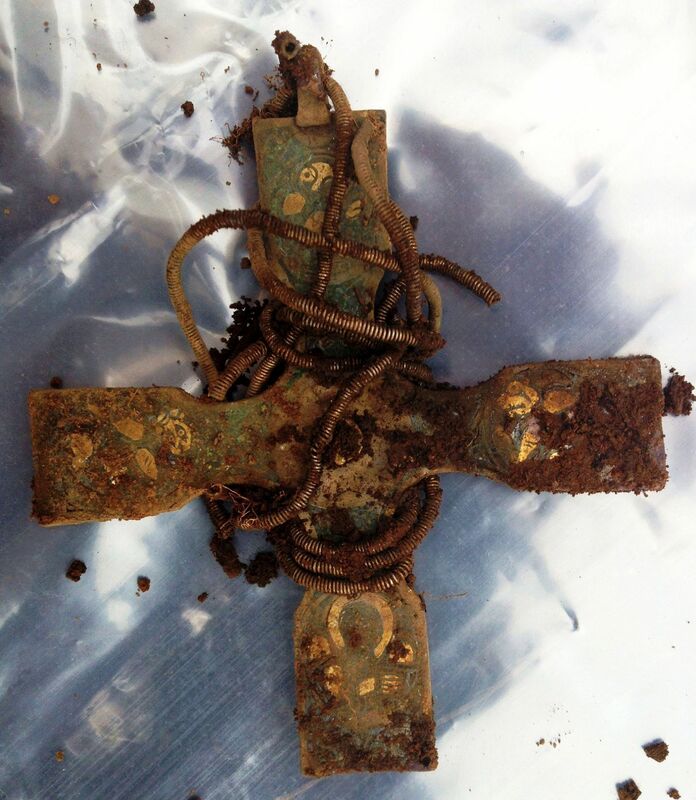 Researchers hope the contents might reveal more information about who buried the treasure under what circumstances. 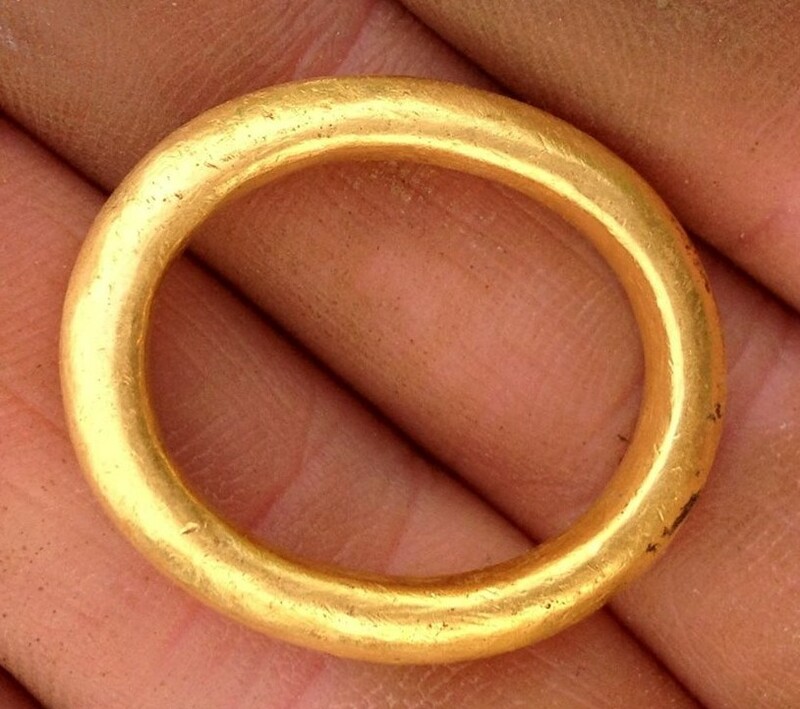 The discovery is governed by the Scottish law of treasure trove which claims the artifacts for the public trust, while rewarding the finder and landowner with a sum equivalent to fair market value of the finds. In this case, early estimates put the value at £1 million, but that could change once the artifacts are examined more closely and the contents of the pot assessed. The landowners, the Church of Scotland General Trustees, and Derek McLennan have already come to an agreement on sharing the reward equally. The Church’s portion will be dedicated to the local parish. This Reuters story has some beautiful close-ups of highly decorated gold and silver pieces. I’d embed it but it has an unkillable autoplay. This entry was posted on Wednesday, October 15th, 2014 at 11:58 PM	and is filed under Medieval, Treasures. You can follow any responses to this entry through the RSS 2.0 feed. You can skip to the end and leave a response. Pinging is currently not allowed. Unless I missed someone saying what it is, the inscription seems to be “TIL”, but not sure what the line above the inscription indicates. The “L” also looks like it may have a very faint diagonal bar on the left side as well, which would make it a faded “T”. I don’t know what that line above means either. That works. Thank you kindly. They came, (t)ra(i)ded and settled: Whenever in Scandinavia the annual farmwork came to a standstill and consequently raids were planned, commuting to Ireland must have benefitted on a wider scale from moving the farmwork to Scotland. The runes on those ingots seem to be either a ‘trademark’ by the person that produced the ingot, or could as well be a mark for quality control. The aerea with the inscription is remarkably ‘wider’, and somebody could have hammered there to find that it is indeed silver, in order to put ’til’/ ‘adequate’ on the ingot. Maybe the vikings – instead of ‘signing above the dotted line’ – scratched their runes underneath. Interesting idea. It wouldn’t be an actual signature, I don’t think. It was my understanding that in most variants, runic phonemes don’t act as our letters of the alphabet which can stand for the initials of a proper name. On the other hand, there were Carolingian runes that mapped to the Latin alphabet. Runes are fascinating and complex. The link to the Reuters article is broken. I used to walk, or run, across a glebe pasture on my way to and from school. 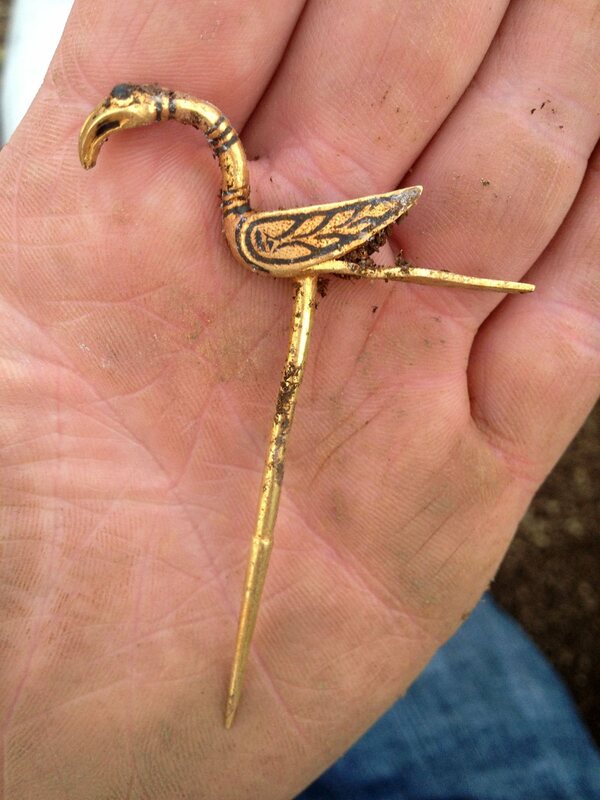 If only I’d had a metal detector (and a co-operative Viking). And then there was the summer I spent working in a village pub near Castle Douglas. If only I’d metal-detectorated, instead of motorcycling and pursuing the waitresses. Opportunities lost, eh? The chain for the cross looks like it’s a long, tightly coiled spring. If it’s anything like a similar necklace I had, I’d bet there’s a ton of hair caught in that thing! I am particularly interested in Scottish history just now, but I had not even considered the way Scots viewed their historical relationship with the Vikings. As you noted, Vikings were usually seen as people who arrived, pillaged and left, not people who came, settled and developed a stable cultural environment of their own. If it is true that the goods and materials came from different countries, that suggests the Vikings were either bigger pillagers or bigger traders than I had thought. “Vikings were usually seen as people who arrived, pillaged and left, not people who came, settled”: I doubt that they are usually seen that way in the Northern Isles, Caithness, or Hebrides. I argue it’s a fake. No expert here, but the removed earth is loose, to me, not the ground, and may not have been an open field then. But again no expert here. I am always interested in the Vikings. I highly doubt it is fake. This would not of been a cleared, open field 1000 years ago. I am highly fascinated about what is in that urn. Have they examined it yet? I desperately want to own an artifact from the Viking era myself. Anyone know any good dealers who ship internationally? LOL – I’m a Viking (www.regia.org), ride bikes (Triumph 900), spent a youth pursuing barmaids and *still* got to dig this hoard out as part of my job. Please check our Facebook for accurate information regarding this find. That is not the perception in Yorkshire. There is even a viking museum in York where they settled. There are Viking burial sites around the Humber. Also many of the villages have Viking names. Does anyone know of the current status of these artifacts? I’m particularly interested in the silver cross. For purposes of research on iconography of that era, I’d like to see what the cross looks like cleaned up, so that I can see what the icons look like on it. They look similar to those images found in the Book of Kells.